Have you ever seen one of those ads promising big investment returns if you subscribe to a stock tip newsletter or sign up for an expensive trading course? Well, have I got a deal for you! This investment tip is guaranteed to give you a 20% return with a maximum time frame of two months. Unfortunately, most of you won’t be able to take advantage of it right now, but if you have an RESP account – keep it in mind for the future. Maximize your RESP contributions while your child is attending school and already making withdrawals. Your child turned 17 this year and just started University. You withdrew money from the RESP to pay for their first semester. In mid-December you get a bonus from work and contribute as much as you can to the RESP. The 20% grant based on the contributions will arrive at the end of January and can be withdrawn immediately. Total time of investment – 6 weeks. Why is this any different than any other RESP contribution? Because the child is already enrolled in school and there will be almost no doubt you can withdraw the money without penalty. Most RESP contributions are made before the child starts school and it is not guaranteed that you’ll be able to keep the grant and make proper educational withdrawals, since they might not attend post-secondary education. The other difference is that you’ll be able to make the withdrawal as soon as the grant has been placed into the RESP account which should happen within two months of the contribution. Not only is the 20% return guaranteed, it’s also very fast. 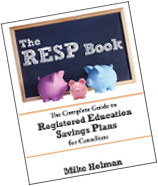 Are you allowed to contribute to an RESP after a withdrawal has been made? Child has to be enrolled in an eligible post-secondary educational institution. Contributions have to be made by the end of the year in which the child turns 17. Child has to be eligible for RESP grants as a 16 or 17 year old. Here are the RESP contribution rules for 16 and 17 year olds. Maximum lifetime grant limit of $7,200 has not been reached. Call the HRSDC at 1 888 276 3624 to find out the grant total your child has received. Annual grant limit of $500 ($1,000 if carrying over a year) has not been exceeded. Here are some RESP contribution examples. What if the student doesn’t need any more money? Do it anyway. You don’t have to show receipts with making an RESP withdrawal. Make the contribution, get the 20% grant and then use it for some extra tutoring or beer. See 8 Things You Need to Know About Withdrawing Money From Your RESP Account for more information. I don’t have any cash. Should I borrow money to do this? If you can borrow money at a reasonable rate and can get a decent sized RESP grant, then this is one time that borrowing to contribute into an RESP is a good idea. For example; Let’s say you borrow $5,000 in early December at 7%, contribute the money to an RESP, get the $1,000 grant at the end of January and withdraw immediately. Your total interest charges will be around $60 and you will have an extra $1,000 inside your RESP account. That’s a pretty good deal. Awesome, free beer money. It really depends on what time of year your kid is born though, fortunately for me, my kid was born late in the year, so it should work for us. Woo-hoo – oh wait, we’ll probably hit the max CESG grant before then, maybe I should hold off and capture the last grant when he is 17. This is a great idea, especially for the late starters (or folks who aren’t maxing out in the early years). Who doesn’t want a 20% guaranteed return? Who doesn’t want free beer money? @Sampson – The birthdate doesn’t matter. You can contribute (and receive a grant) for the child up to the end of the year in which they turn 17, ie December 31st. Really great stuff here Mike! I love it when I learn something new! @Jim – Thanks a lot. The fact that you learned something is a pretty good compliment. Your example is incorrect, http://www.canlearn.ca/eng/saving/cesg/brochure/cesg-eng.shtml states that the maximum CESG allowed in a calendar year is “Between $500 and $600 per year” (depend on income). Contributing any amount greater than $2500 would yield you diminishing returns. The example is correct. You are allowed to carry forward grant-eligible contribution room. I stand corrected, thank you for the pointer! Wow, great tip! I’ll try and remember this 20 years later 😉 hopefully they’ll still have the RESP! Hey Mike, cool little move. Sort of similar to someone turning 71 who has to convert to a RRIF. In December of the year they turn 71, they over contribute to their RRSP ( assuming they have earned income in that year), have a one month penalty and then they get to claim their RRSP deduction when they are 72. Thanks Mark – perfect analogy. Awesome idea Mike. I love how many articles you do on RESPs. I am a huge fan of them as well. The fact that you can get an automatic return of 20% on a $3,000 every year floors me. I hope to start one for my kids (haven’t come to that bridge yet) as soon as I can. I like the message it sends to parents, that they have to share in the cost of educating our next generation (instead of just taxing everyone).